October 1 marked the beginning of the annual National Cyber Security Awareness Month (NCSAM) in the United States. NCSAM is a collaborative effort designed to ensure that every American has the resources they need to use the Internet safely. Internet security is a big subject, so NCSAM is broken down into five parts to make it more manageable. This week we are looking at the second topic in the series, Creating a culture of cyber security in the workplace. All organizations – from large and small businesses to healthcare providers, academic institutions, government agencies and civil society – can experience data breaches or be targets of cybercrime, which can result in stolen intellectual property, theft of personal information or – if our critical infrastructure is attacked – a disruption to our way of life. In this model, the ball in the middle of the triangle represents the balance between three desired states of technology. 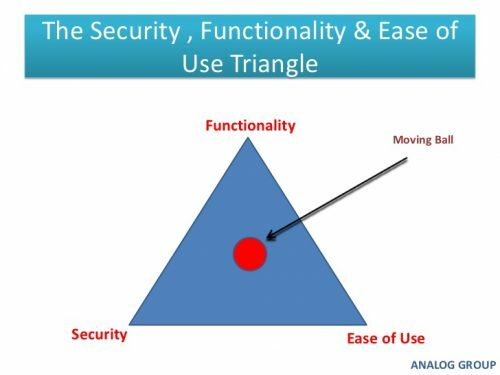 IT security fatigue becomes an issue when the ball moves closer to the security side and away from functionality and ease of use. Infographic: Creating a Culture of Cybersecurity infographic identifying steps that lead to a safer workplace. Download the pdf here or see a preview here. NCSAM 2016 Media Backgrounder: a pdf full of information on security incidents and how to keep yourself protected. Download the pdf here or see a preview here. Twitter Chat: Join @STOPTHNKCONNECT's Twitter chat on Thursday, Oct. 13, at 3 p.m. EDT/noon PDT to discuss creating a culture of cybersecurity at work. Use #ChatSTC to join. Mid-South Cyber Security Summit: The National Cyber Security Alliance is partnering with the FedEx Institute of Technology Cluster for the Advancement of Cybersecurity and Testing (CAST) and the Center for Information Assurance to host the Mid-South Cyber Security Summit on Friday, Oct. 14, in Memphis, TN. Register here, and livestream the event here. Protect Your Workplace brochure: This pdf includes tips on physical and cyber security guidance, and contact information you'll need if you are a victim. If you are needing some assistance getting your head around security concepts at your office, here's a video from our team that explains threat vectors and attack surfaces. It also highlights our approach to securing the threat vectors the easiest way possible.